President Barack Obama made clear Wednesday that the United States won't provide support or resources to the Hong Kong protest movement that has snarled traffic for weeks and forced a standoff with the mainland’s Communist Party over fair and free elections. After more than two days of talks with China’s President Xi Jinping, Obama dodged reporters’ questions about the mass sit-in movement by claiming that while the United States supported democratic elections in Hong Kong as a matter of principle, the issue was ultimately none of America’s concern. The president’s tepid remarks come as the Hong Kong government shows increasing signs that it will clear the streets of the protestors’ three encampments in the coming days. After more than six weeks of mass sit-ins in the streets, many outlets report that the movement is faltering and public opinion, which used to be marginally in favor of the public protests, is turning against the tactics of the pro-democracy advocates, if not their goals. Hong Kong media are reporting that the police will likely move into the encampments this week to start taking down barricades and removing the student occupiers, particularly now that the Asia-Pacific Economic Cooperation summit concluded Tuesday. The protestors show little signs of leaving the streets, despite the government warnings. Student activists and everyday residents first took to the streets in September, after the National People’s Congress Standing Committee announced that the Chinese Communist Party would control who could become a candidate in the 2017 elections for Hong Kong’s Chief Executive. In turn, the Umbrella Revolution is demanding free and fair elections in which candidates are publicly nominated. At first, the protests swelled to close to 100,000 strong after the police responded with tear gas and rubber bullets. In the intervening weeks, the numbers of occupiers has fluctuated. Back in October, the protestors seemed to be having an impact as they forced the Hong Kong government to the table for talks. But the talks went nowhere and both sides settled back down on either side of the political impasse. On the issue of Hong Kong, which did come up in our conversations, I was unequivocal in saying to President Xi that the United States had no involvement in fostering the protests that took place there. These issues are ultimately for the people of Hong Kong and people of China to decide. From one standpoint, Obama’s decision to avoid controversial comments seemed a practical strategy to make gains on other aspects of the U.S. relationship with China, namely on trade and environmental regulation. On Tuesday, Xi and Obama announced an unprecedented agreement between the two countries to curtail their carbon emissions in line with targets more aggressive than expected. Although the agreement could stumble before a Republican-dominated, fossil fuel-loving Congress, it represents a historic step forward in efforts to rein in greenhouse gas emissions and stave off the worst effects of global warming; China and the United States are the two biggest economies and the two largest emitters of greenhouse gases. Such a step forward might not have been possible had the U.S. taken a hard line on the Hong Kong protests and demanded that China relax its controlling grip over the 2017 elections for the city’s next leader. But the president’s distancing of America from what is happening in Hong Kong could also be a boon to the protestors themselves. 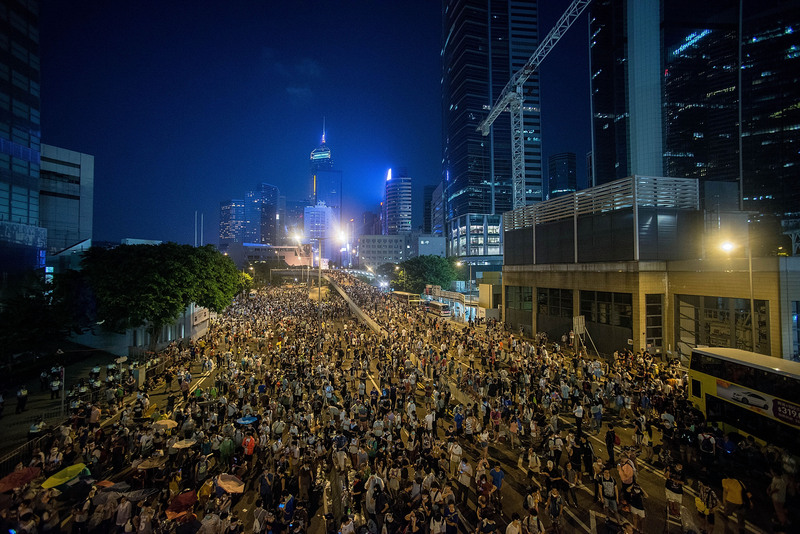 A strong statement of support from the U.S. would have just given more fodder to Hong Kong and Chinese officials alike that seek to discredit the movement by characterizing it as foreign agitation rather than as a home-grown, indigenously-led groundswell of resistance. What the United States could have offered in solidarity might have been greatly outweighed by the damage inflicted to the protestors’ legitimacy in the eyes of their fellow citizens. One of the easiest ways to foist off a credible resistance movement is to pretend that it is motivated and funded from the outside. Hong Kong's unpopular Chief Executive Leung Chun-ying has already criticized the protests as “not entirely a domestic movement.” And a Chinese state newspaper, The People's Daily, accused the U.S. government and NGOs of intervening on behalf of the protestors. The movement leaders will have their hands full enough over the next few days as they fortify themselves against the increasing likeliness that the police will be taking down their barricades and leading mass arrests. They don’t need to get stuck defending their Hong Kong credentials as well.